When it comes to repotting my plants, I admit I’m a bit of a nervous nelly, always afraid of doing more harm than good by repotting it the wrong way or at the wrong time. And the thought of repotting desert rose plants (Adenium obesum) was no exception. The following questions kept circling over and over in my mind, “Should I repot my desert rose? How to repot a desert rose? When to repot desert rose?” I was one bewildered and anxious gardener. The answers, fortunately, came to me and I’d like to share my desert rose repotting tips with you. Read on to learn more. Should I Repot My Desert Rose? Repotting is par for the course for desert rose owners, so it’s safe to say that a repot is definitely in your future and, more than likely, many times over. Is your desert rose the size you desire it to be? 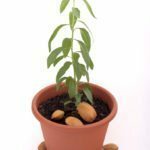 If your answer is ‘no,’ then it is recommended that you repot it every year or two until it reaches your desired size, as overall growth is decelerated once the plant becomes pot bound. Have the roots of your desert rose infiltrated through their container or has its thick swollen stem (caudex) overcrowded the container? If ‘yes,’ then that is definitely a good indicator that you should repot. 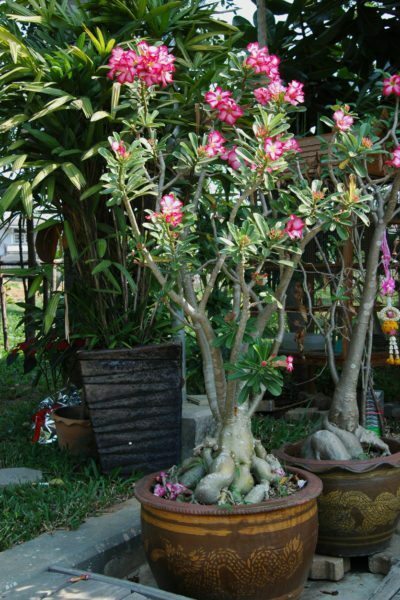 Desert rose roots have been known to bust through through plastic pots and even split or crack clay or ceramic pots. 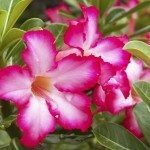 Desert rose repotting should also be done if you suspect it has root rot, which the plant is susceptible to. 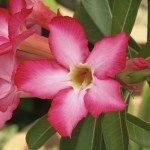 The general rule of thumb is to repot desert rose during its period of active growth in the warm season – springtime, specifically, is most ideal. By doing so, the roots will have a full season of root growth ahead to expand and fill their new accommodations. Safety first! 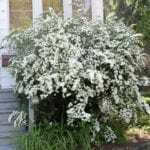 Wear gloves while handling this plant, as it exudes a sap that is considered poisonous! Seek out a container that is 1 to 2 inches (2.5 to 5 cm.) wider in diameter than your previous one. Just be sure that the container chosen has good drainage to give the desert rose the dry roots it prefers. Thick-walled, bowl-shaped containers are suggested since these style pots not only provide room for the roots to fan out but have a shallowness about them which allows soil to dry more quickly. You may use any type of pot such as clay, ceramic or plastic; however, clay pots may be a consideration, as they absorb excess moisture from the soil, reducing the potential for root rot. Use a potting mix formulated for cacti or succulents or use regular potting soil mixed with equal parts perlite or sand to ensure the soil is well-draining. When repotting desert rose plants, make sure the soil is dry before gently removing the desert rose from its pot. 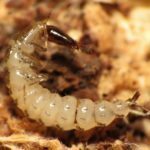 The extraction may prove easier if you prop the container on its side and try wiggling the plant free with a firm hold on the base of the plant. If the container is malleable, such as plastic, try gently squeezing the sides of the container as this will also help coax the plant free. 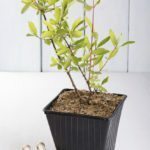 Then, while holding the plant by its base, invest some time removing the old soil from around and in-between the roots. Prune away any unhealthy roots you uncover and treat the cuts with a fungicide. Now it’s time to situate the plant in its new quarters. With a desert rose, the ultimate goal is to have an exposed engorged caudex above the soil line, as that is really the plant’s signature trademark. The caudex is a thick, swollen area of the stem near soil level. The process to encourage an above ground bulbous caudex is referred to as “lifting.” However, it is not recommended to start lifting and exposing the caudex until your plant is at least 3 years old. 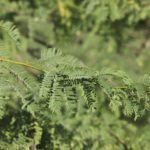 If your plant is of the right age, then you will want to situate the plant so it sits an inch or two higher above the soil line than it did previously. If you are exposing the caudex, please be aware that the newly exposed part is susceptible to sunburn, so you will want to gradually introduce the plant to direct sunlight over a several week timeframe. Get your plant into position in its new pot and then backfill it with soil, spreading out the roots as you go. Do not water the plant for a week or so after repotting to ensure that any damaged roots have had time to properly heal and then gradually resume your regular watering regimen.